Four other watch faces have made their way to the Series 4 -- vapor, liquid metal, breathe, and fire & water. We saw these four faces already with watchOS 5 on existing Apple Watches, but they were clearly designed with the Series 4 in mind. That new improved performance lets Apple Watch Series 4 monitor a new data point -- falls. Apple has trained the watch on three distinct types of sudden descent. A straight-down fall, a slip, or a trip -- all with their own distinct motion pattern. On Series 4, there is support for identifying atrial fibrillation, and taking an ECG. Both of these features are missing at launch, though will be showing up with the watchOS 5.1 later this fall -- at least in the United States. Apple has used a similar process here. When the watch is off, or on a screen that is unable to scroll, rotating the crown does nothing -- and feels like nothing. Pre-installed on each Series 4 Apple Watch is watchOS 5 -- Apple's latest mobile operating system that debuted earlier this year at WWDC. It is full of new features that nails down the experience of Apple Watch. “Full realization” might also include an alert when I leave my phone behind. Please? I don't understand why Apple didn't make a Stainless Steel version available in GPS option. Argh! I don't need cellular as I carry my iPhone all the time. Don't have any choice but maybe i'll just get the Nike version. 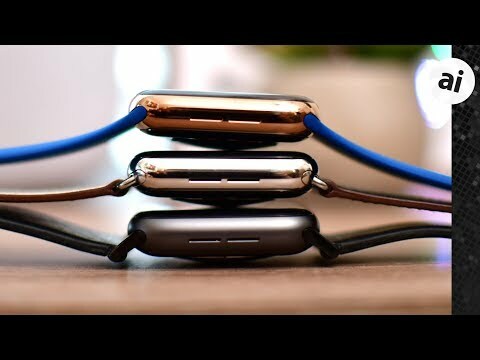 Could you please tell me which blue sport band was used for the gold stainless steel Apple Watch? Is it the new Blue Horizon? In the Video the blue looks to saturated and on the Apple website Horizon Blue looks more pale in comparison. So I wonder if it may be a third party band. I coveted this watch from the second I saw it in the Apple store. Can’t wait for it to arrive! Well, hopefully you’ll never lose your phone, break it, or have it stolen, or leave it behind. You don’t need to even activate the LTE service for it to be useful. My mom forgot her phone at home when she ran an errand one day, and of course that’s the day her car broke down, stranding her on the road, and having to seek out a phone to call a tow truck. It’s cheap insurance to have access to emergency services without even paying for a phone plan to otherwise use the calling and data features. A friend had his phone stolen while traveling and would have had a real problem if not for his LTE connected watch. You don’t need to even activate the LTE service for it to be useful. My mom forgot her phone at home when she ran an errand one day, and of course that’s the day her car broke down, stranding her on the road, and having to seek out a phone to call a tow truck. It’s cheap insurance to have access to emergency services without even paying for a phone plan to otherwise use the calling and data features. A friend had his phone stolen while traveling and would have had a real problem if not for his LTE connected watch. It comes really handy on situation you mentioned. AT&T charges $10 + fees etc, and I find that too much. If that would have been $5 per month, I probably would get a cellular version. The cellular model costs $100 more than GPS only. Not a problem for me, although I'm not buying either, but if the only use for cellular is in a situation where you forgot your phone or it was stolen, it doesn't seem worth it. Not having your phone is not a "real problem", at least from a communication perspective. You just walk into any Walmart, 7 Eleven, or Verizon store and buy a cheap prepaid burner phone with minutes for less than $100. As far as being stranded with your car, perhaps you should consider a car with roadside assistance built in. Every car I've owned in the last 20 years had that service. I've grown very happy with my series 3. At first I wasn't sure what it would mean for me..'do' for me. But I find it very useful and enjoy using it, which is a huge key. I will likely sit out this upgrade cycle but I'll continue to upgrade as needs and currency allow. Infograph face should have an option to greyscale all its complications. Submit that as feedback. Not a watch wearer personally, but that is a great idea. It should be free on the same plan. You can't even gray-out all of the normal face complications so that would be unlikely. Especially since some of them rely on the presence of color to (ex: temp from cool to warm). Fedex has mine coming in on Monday Oct 1, much earlier than the original Oct 5-12 estimate from Apple. Quite pleased. Ultraviolet, came out last year. I previous has my order with B&H Photo when I heard they don't have tax, but they seem to be observing religious holidays a lot during this initial release. They observed the Sabbath, so no preorders were accepted during the announcement day. Then a few days ago, I email them a status update and they are closed for the week because they are observing the Sukkos Holiday and won't open again until October 3rd. Wish I knew about ABT as I ordered from Best Buy and am getting the Gen4 today to replace my Gen2. Are you in the US? Then by law the phone will make 911 emergency calls without a monthly fee. Well, if you forget your phone enough, dropping $100 every time you need to replace it for whatever reason could get expensive. A burner phone likely doesn't have access to any of your iCloud info, contacts, etc. and I'm not aware of any $100 burner iPhones. Also, if you chose to buy a new iPhone while on a trip, you'll need another device for two-factor authenitcation in order to access your iCloud info on the phone, and the Watch which requires the phone does not suffice. As for OnStar or other built-in services, well you're also paying for that, separately, or in the price of the car. My mother doesn't have that. Many people don't. So it's just a matter fo what solution works best for you. Anecdotally, we could likely go back and forth all day with scenarios where having a cellular watch would be advantageous, and you'd have an alternative that suits you better. To each his own. I know two specific situations where having the cellular AW made a big difference. I'm not saying that's enough for everyone, or even applicable to everyone, but it's something to consider, which the OP didn't seem to be. Unlikely or not, it’d be a nice option. Temp doesn’t rely on colour: the temp is literally written on that complication. That combined with a bar going from light to dark would be fine for users who want a lot of information on their watch face without a lot of colour. There would also have to be some accessibility advantages for the greyscale option here also. Well, if you forget your phone enough, dropping $100 every time you need to replace it for whatever reason could get expensive. You're right, I just don't ever forget my iPhone, but if I did it would not be the end of the world. I'd just live without until I got back home. I almost always have my MBP in the trunk of the car if I really needed to contact someone. Both my cars have their own wifi hot spots. Some people are just so attached to their devices it causes tremendous consternation even if the cell signal gets a little weak.